Families, couples and groups who want to relax near Arenal Volcano without breaking the bank. Casa Luna (meaning Moon House) is an eco-conscious hotel in the Arenal Volcano area. 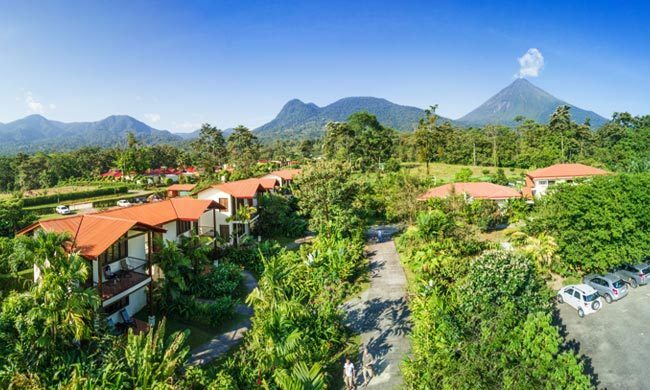 Surrounded by lush gardens and Arenal’s rainforest, this hotel focuses on providing a relaxing stay in a family-friendly ambiance, along with keeping up good environmental practices. Relax and commune with nature while Arenal Volcano watches over you in the distance. Relaxation. The hotel is designed to provide the peace. Gardens. Lush and well-maintained, there is vegetation peeking from every corner. Sustainable practices. This hotel is committed to the protection of nature. Upscale luxury. Your basics are covered but don’t expect anything extravagant. Resort feel. This is a boutique property without the large crowds of brand resorts. Surrounded by mountains and with views of Arenal Volcano, Casa Luna is an ideal location to retreat from the noise of everyday life. Enjoy some peaceful time in this hotel in La Fortuna. It’s three hours away from the San Jose International Airport, in a scenic route across Costa Rica’s countryside. Casa Luna also provides unique views of Mount Chato, which translates to Mount Flat-Nosed. Mount Chato is, in fact, an inactive volcano right next to Arenal Volcano itself, which looms in the background across clouds and mist. This hotel will resonate with those travelers who want to unwind and leave their worries behind in a Costa Rican paradise. Casa Luna’s name evokes the hotel’s aesthetic. Inspired by the rustic colonial homes of yore, each of the rooms and main facilities was built to incorporate local decorations and materials that provide an authentic Costa Rican feel. Rooms use a variety of earth tones that bring up the colors outside the window. Sustainably obtained woods, metals, and tile roofs were also used to create a cozy environment. All of them have a terrace or balcony that allows both light and air indoors. This is the perfect spot to enjoy a morning coffee before heading out for breakfast or adventures. Some of them also have garden views, which gives you the opportunity to observe the local wildlife from the comfort of a chair. Casa Luna has an adult and children’s pool to splash in and help combat the tropical heat. It also has four jacuzzis to relax in and warm the nights. Casa Luna is all about delighting in personalized service while being in harmony with nature. Nestled in the jungle near a river, the hotel is committed to protecting the natural resources around it. Due to reforestation and preservation practices, trees and flowers have grown more in recent years and seamlessly blend with the hotel’s own gardens. These are well-kept, seeking to attract the lively and unique wildlife in the area. Take a hike across the trails on the property and discover toucans, hummingbirds, lizards, turtles, and howler monkeys jumping from tree top to tree top. The hotel’s dedication to the environment is felt throughout, from their on-site farm where they grow many of the restaurant’s ingredients to the different certificates they have to demonstrate their commitment, including the PAS 2060 Neutral Carbon Certificate. If you want to learn more, take their free sustainable production tour where a guide tells you all about the different techniques used to be environmentally friendly. Casa Luna has an option for everyone. As it is a family-oriented hotel, there is a playground in the property to let the children play to their heart’s content while enjoying the fresh mountain air. If you want to step up your relaxation mode, Luna Spa offers massages and treatments. Visit for some ‘me’ time or share the time with a loved one. Enjoy a body treatment or facial to reinvigorate your skin, or let a professional masseuse squeeze the tension from your muscles. When it comes to food, Luna Grill Restaurant has you covered. Like the rest of the hotel, the restaurant gives off an ambiance of rustic charm. It also provides special options for children and vegetarians. Food is locally sourced, and many of their ingredients are grown at the organic farm. Fish and prawn are also kept in the hotel’s ponds. Have lunch while enjoying the gardens and view of Arenal Volcano. For a drink or snack, Luna Bar & Coffee and the Luna Tropical Snack Bar are the places to go. Whether it’s a cocktail or a quick bite, choose your favorite among the lists and sit back to unwind in the terrace. To try something absolutely Costa Rican, you can’t go wrong with coffee. As Costa Rica’s most famous product, a cup of coffee is a must while in the country. If you want to get more active, Arenal has plenty of opportunities as well. Known as the Adventure Capital of Costa Rica, Arenal provides options for all kinds of tastes and ages. There are nature excursions like tree planting, farm experiences, and hanging bridges, to venturing into the unknown while exploring caves or attending night tours. For adrenaline-infused activities, there’s zip lining, white water rafting, river tubing, and more. Arenal has plenty for those days when you want to pump it up. Then return to the hotel to rest and enjoy your cozy, peaceful room. If you want an unpretentious stay by Arenal Volcano, with on-site services, pools, and a relaxing ambiance, then Casa Luna may be the place for your Costa Rica Vacation. Simply contact us and we will gladly help you arrange your stay!